What is an IED Jammer? How does an IED Jammer Work? Can an IED Jammer jam all IED threats? Can an IED Jammer detonate an IED instead of Jam the IED? Who uses an IED Jammer? The Bomb Jammer ™ series of IED Jammers are designed to saturate an area with electromagnetic energy in order to neutralize an IED that is activated by remote control on command. Our IED Jammers work by preventing radio signals from reaching the radio trigger used to detonate that IED. Because the IED Jammer can broadcast RF Jamming interference on multiple frequencies simultaneously, all known threats can be addressed. 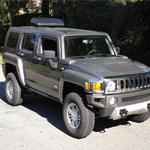 The Bomb Jammer ™ in its trunk mounted form as well as the roof mounted version were not designed to detonate IED weapons. The sole purpose of an IED Jammer is to jam only. RCIED or Radio Controlled Improvised Explosive Device weapons are on-command bombs that require a trigger by radio control, and as such, are almost always designed to detonate with some basic radio frequency coding. This coding prevents accidental activation by random radio frequencies it might receive. The IED Jammer series are designed to jam using electromagnetic energy and not detonate a remote controlled IED or RCIED. 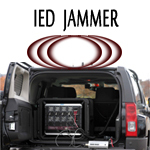 Users of our IED Jammers, Communication Jammers, and RF Jammers range from mine clearance teams, military forces, border patrol, bomb detection teams, VIP security forces, Law Enforcement Agencies, EOD technicians, Government Contractors, and Government Agencies. 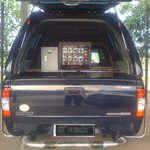 The IED Jammer is a reliable IED Jamming System, vehicle mounted inside to neutralize an RCIED or Remote Controlled Improvised Explosive Device, Cellular IED, Satellite Phone IED, walkie talkie IED, as well as radio reciever IED detonation systems. Programmable Jammers are used by those who require control over a modular jammer with user selectable frequencies. Comparing our Programmable IED Jammer to other IED Jammers and RF Jammer technologies, unique features include communication jamming and communication windows. IED Jammers such as our high power RCIED Jammer model VIP300TE conduct RF jamming to defeat roadside bombs by radiating them with barrage jamming energy waves. 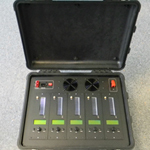 Radio Jammers are used by bomb detection and EOD technicians when a bomb threat happens, be it on site or in response to an alert or event.